Even though the Universe is constantly changing, most processes are too slow to be observed within a human lifespan. But now an international team of astronomers have observed an exception to this rule. "SAO 244567 is one of the rare examples of a star that allows us to witness stellar evolution in real time", explains Nicole Reindl from the University of Leicester, UK, lead author of the study. "Over only twenty years the star has doubled its temperature and it was possible to watch the star ionising its previously ejected envelope, which is now known as the Stingray Nebula." Back in 2014 Reindl and her team proposed a theory that resolved the issue of both SAO 244567's rapid increase in temperature as well as the low mass of the star. They suggested that the heating was due to what is known as a helium-shell flash event: a brief ignition of helium outside the stellar core. This theory has very clear implications for SAO 244567's future: if it has indeed experienced such a flash, then this would force the central star to begin to expand and cool again—it would return back to the previous phase of its evolution. This is exactly what the new observations confirmed. As Reindl explains: "The release of nuclear energy by the flash forces the already very compact star to expand back to giant dimensions—the born-again scenario." The results will be presented in the paper "Breaking news from the HST: The central star of the Stingray Nebula is now returning towards the AGB", published in the Monthly Notices of the Royal Astronomical Society (MNRAS). 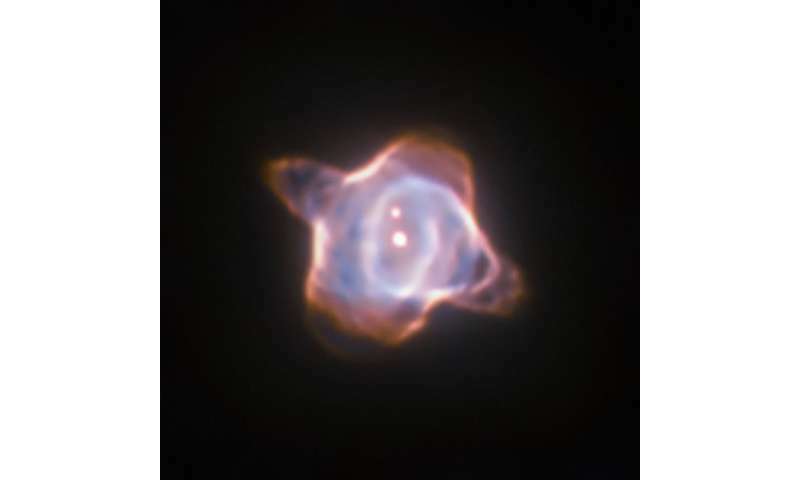 The temperature of a star is directly linked to the speed of rotation of the star (along with mass and the effects of the binary system (lower part)).